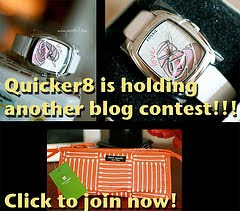 Luckyfinds: Another Giveaway Quicker8.com ! Multiple blog post is allowed. You get 5 Entries for each post. 3. Leave a comment in the contest post to post links and what you did - 1 Entry. 4. Comment on any of her posts from Oct 12, 2010 to Dec 18, 2010 and get 1 entry for each comment.